Mercedes-Benz AMG’s ‘Black Series’ concept has just gone viral. This bad-arse modification process adheres to a strict two-door, two-seat policy – as evidenced by the left-hook-only SLK55 Black (2006), the CLK63 Black (2007), SL65 Black (2008) and the recent C63 Coupe Black (2011 - read review here). 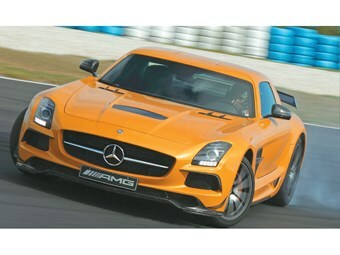 But the latest Benz to succumb to the dark side – the SLS Black Series – tweaks the whole concept into the stratosphere. Even in rag-roof roadster form, the "standard" SLS is a serious performance machine sporting a dry-sumped 420kW V8, a 0-100km/h time under four seconds and a top speed of 317km/h. But it’s more of a road warrior than a track maestro, as anyone who’s driven one flat-out around Phillip Island or Eastern Creek will tell you. The non-Black SLS is quick, but it’s also edgy, unsettled and not easy from which to extract the best (read review here). Considering the race SLS was the world’s most successful GT3 car in 2012, the Black Series is essentially a road-going homage to the GT3 car – "a race car, street legal", according to Tobias Moers, AMG’s Director of Vehicle Development. 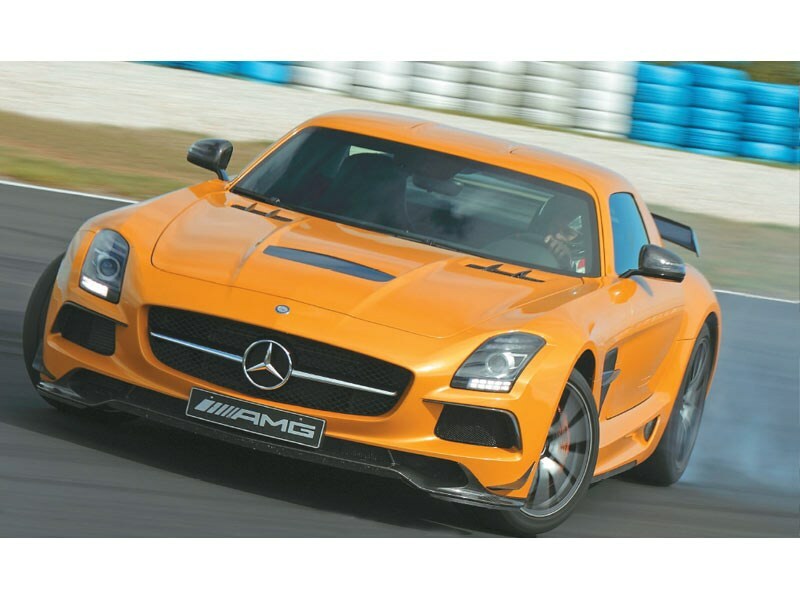 Around 70kg has been stripped from the regular SLS through measures like a titanium sports exhaust (-13kg), a lithium-ion battery (-8kg), ceramic brakes (-16kg), AMG sports buckets (-15kg) and switching to a carbon fibre torque tube, instead of a cast-alloy one (-13kg). Yet power from the 6.2-litre naturallyaspirated V8 has risen by 44kW to a ferocious 464kW at 7400rpm. Thanks to revisions to the valve gear, intake air ducting and a completely reconfigured belt-drive system, the 6.2 is now capable of 8000rpm (up from 7200), which is deeply impressive for such a big-capacity engine. And it’s been suitably beefed-up in order to keep nudging that limit hour after hour. Then there’s the incredible fashion in which the SLS Black transfers all that muscle to the tarmac. Boy does this thing love to devour a racetrack. 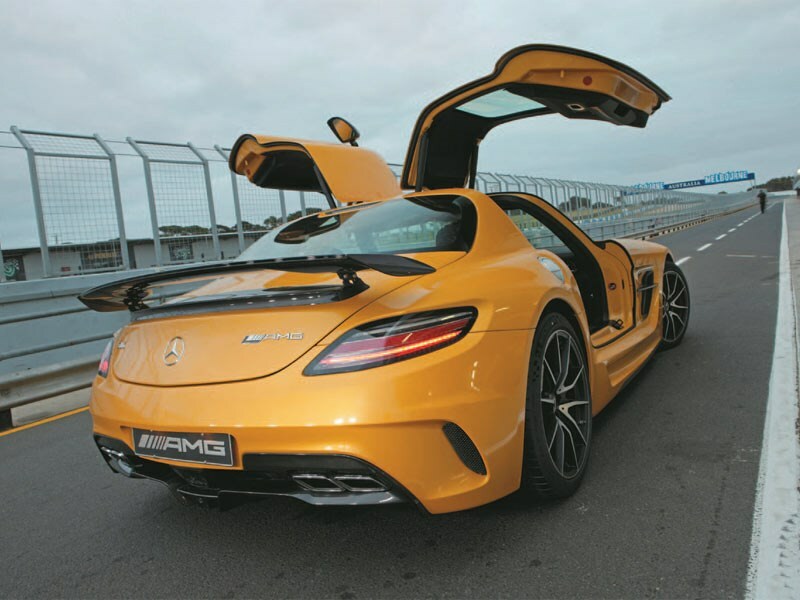 The Aussie introduction involved just one car – a left-hand-drive, Solarbeam-yellow SLS Black Series sporting the optional AMG Aerodynamics package – at Phillip Island. And talk about a successful first meeting. The SLS Black is simply a revelation. Sure, there’s a visceral thrill hammering a race-bred weapon around a track as brilliant as Phillip Island. But it’s the fact that the SLS Black has successfully managed to right every single wrong of the regular SLS that made this exercise so rewarding. A number of factors have turned the SLS into a track supremo. Firstly, the sizeable downforce created by the optional AMG aero kit, which does cruel things to the drag coefficient when adjusted to the Level 2 track setting, but great things to the SLS’s high-speed composure and chassis balance. 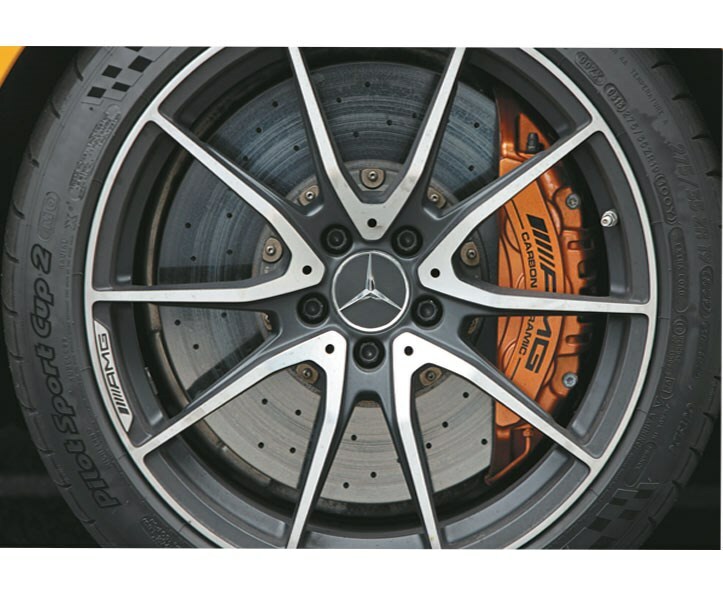 Secondly, the Michelin Pilot Sport Cup 2 tyres developed specifically for the SLS Black, which are sensational, and some mention has to be made of the massive ceramic brakes – 40 percent lighter than the standard stoppers, yet capable of copping a severe pounding. Lap after lap, these huge brakes effortlessly pulled the SLS Black up from speeds beyond 240km/h at the end of Phillip Island’s main straight, and into turn one, the mid-corner grip from the Michelin Cup tyres couldn’t be breached. Punching out of corners, the enormous 325/30 ZR20 rear boots simply hooked up and launched the SLS Black at the next corner, as if you actually were driving a race car, while ensconced in carbon fibre-laced luxury. Compared with the standard SLS, it’s the old chalk-and-cheese cliché. Seemingly limitless grip and sublime balance versus oversteer minimisation and unsettling edginess. In Black Series form, the SLS is a true supercar. The price you’ll pay for this phenomenal prowess is a rather anti-social $639,000, beginning in July when the first of 10 cars ordered for Australia will arrive. But despite all the bad-boy bullishness of the SLS Black Series, I have a feeling it would also be at home popping down to the shops for milk and a paper … if you don’t mind being noticed.